Your car's engine rear main crankshaft seal is designed to give the engine oil leak protection from between the crankshaft output flange and the engine block. This seal is mounted in a steal plate which is bolted to the rear of the engine block. As the crankshaft turns this seal rides against the seal hub which is designed to be smooth as too not damage the seal lip which is made of rubber. 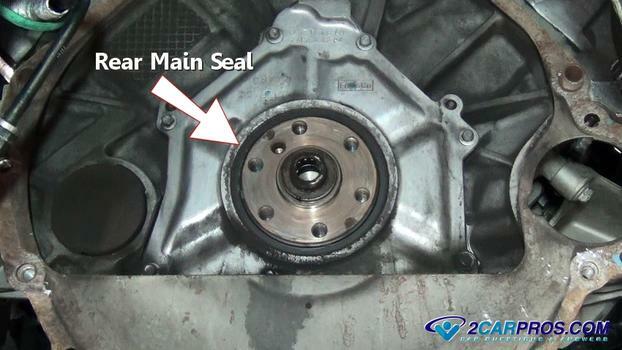 This seal is located between the engine and transmission just behind the flywheel. 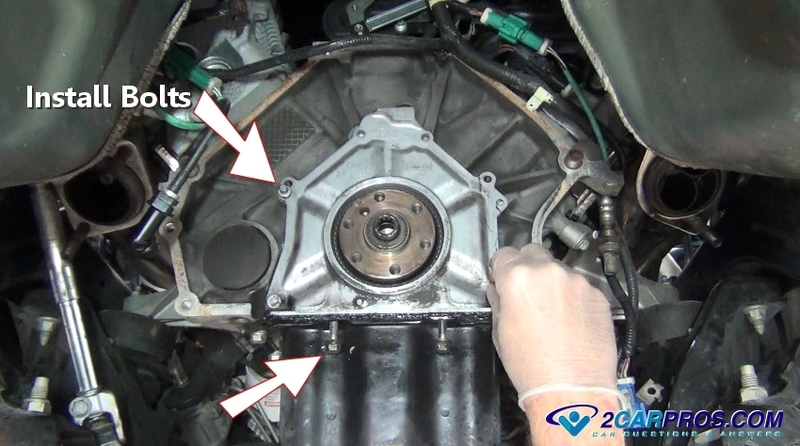 Heat and engine vibration is responsible for causing the rear main seal to fail. 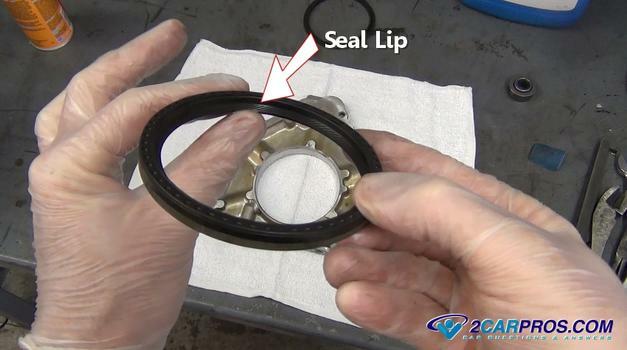 This is because the seal is made of rubber and can become hard and brittle causing the lip of the seal to fail allowing engine oil to bypass the seal and leak outside of the engine. When this problem occurs engine oil will leak into the transmission bell housing which will show up at the most downward part of transmission near the flywheel. If the car is equipped with a standard transmission is will contaminate the clutch disc causing the clutch to grab and not disengage. 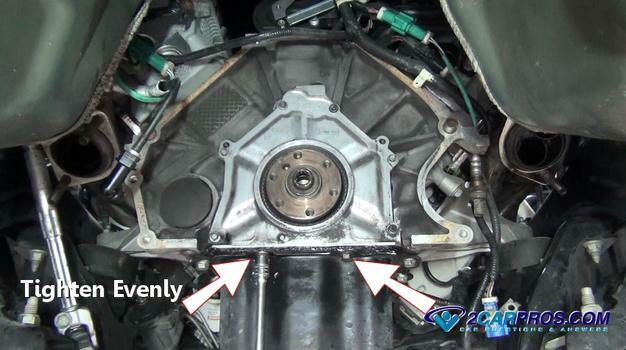 This repair job is usual fairly expensive since the transmission and flywheel will need to be removed. The seal itself will cost between $13.00 and $35.00 on Amazon and that is pretty much all you will need beside maybe a small amount of transmission fluid. If you are having the job done at a repair garage or dealer you can expect to pay between $650.00 and $850.00 for the labor depending if the car is front or rear wheel drive in most cases. 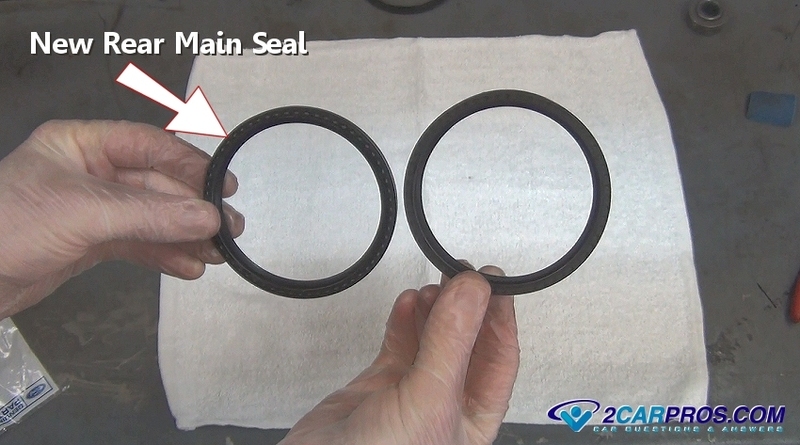 A front main seal is much easier and less expense to replace. There is a video of the job being done at the bottom of this guide. Start by raising the car on four jack stands using a floor jack. Put the car as high as possible to give you more room under the car which will help make the job easier. Wear protective eye wear and gloves before getting started. This job will vary depending on if it's a front wheel or rear wheel drive car. Some steps like removing the exhaust system may or may not need to be done as well. When removing the transmission you will need to remove the starter in the process so you should disconnect the battery's negative cable to avoid short circuits. 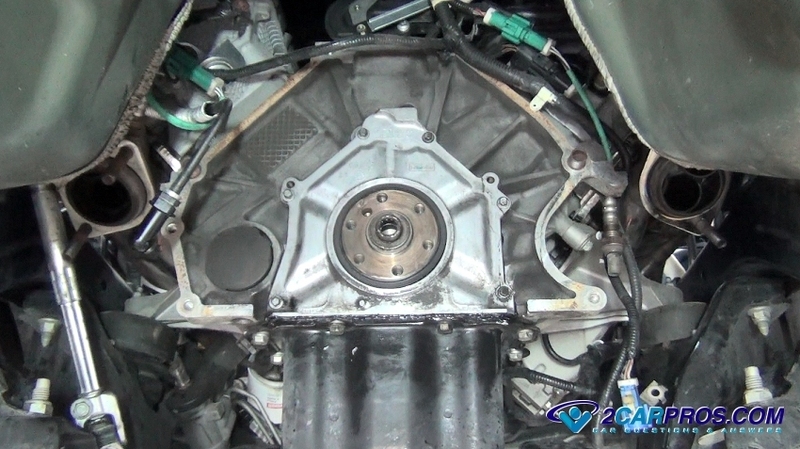 The engine will need to tip downward to allow enough room for the transmission to be removed. Also, if the exhaust system is in the way of the transmission coming out the exhaust will need to be partially or completely removed. 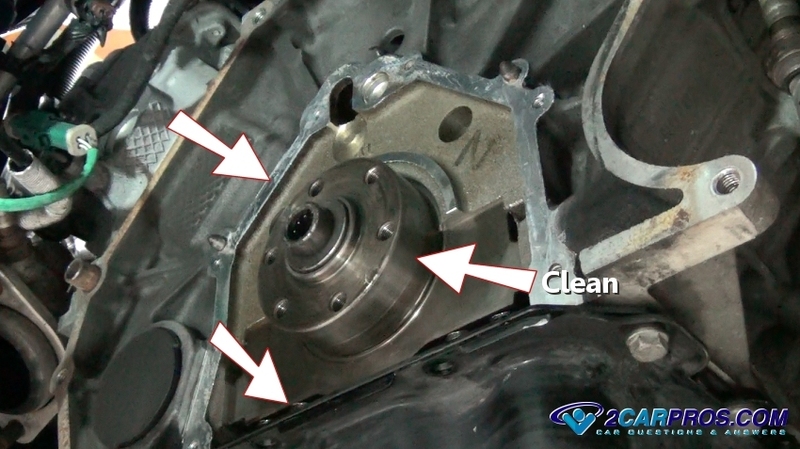 No matter if the car is front wheel or rear wheel drive, automatic or stick shift the driveshaft or CV axle will need to be removed to allow clearance for the transmission removal. There is not that big of difference if the transmission is automatic or stick shift when attempting to remove the transmission. The main difference is an automatic transmission will have two cooler lines running up the the radiator which will need to be undone using a line wrench and the torque converter will need to be unbolted from the flex plate. 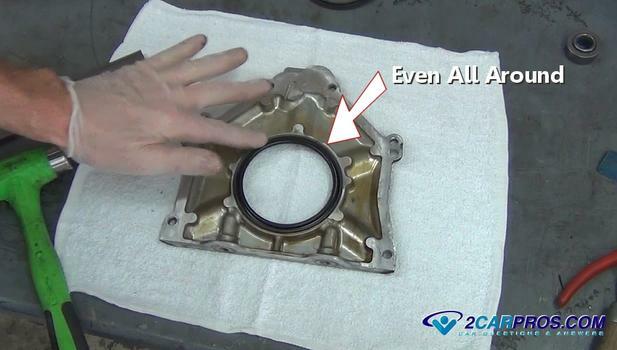 A car equipped with a standard transmission will have a clutch and flywheel that will need to be removed before replacing the rear main seal. A car quipped with an automatic transmission will need to have the flex plate removed which is easier because it just unbolts from rear of the crankshaft. Now that those additional jobs are out of the way you can get down to replacing the rear main seal. Like we said, most of the job is getting to the seal but now that you have gotten this far let's continue with the job. 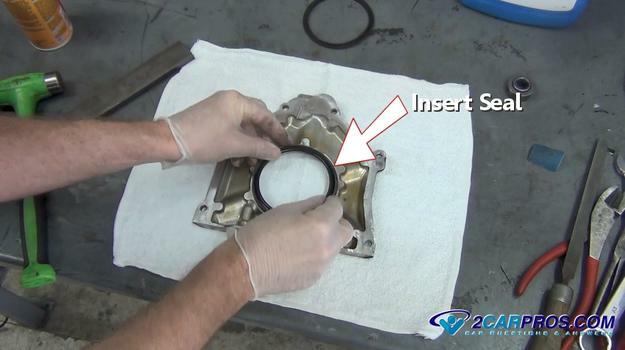 The image below shows what a typical rear main seal looks like pressed into its housing bolted to the rear of the engine block. The cylindrical metal piece sitting in the middle of the seal is the crankshaft which is the part that turns when the engine is running. There is a smaller piece in the center of this crankshaft which is a pilot bearing which will be included on rear wheel drive stick shift cars only. This seal was not leaking too badly but since we where replacing the clutch anyway we decided now would be the time to replace the seal. 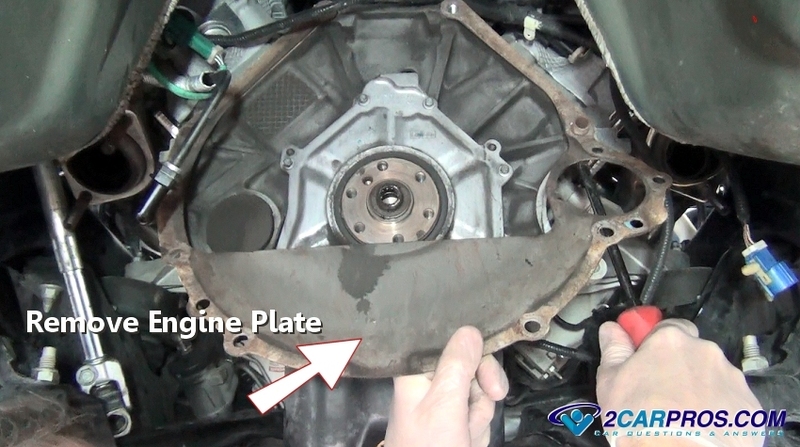 Some application will have a thin metal plate between the engine and transmission which will need to be removed before you can remove the rear main seal. 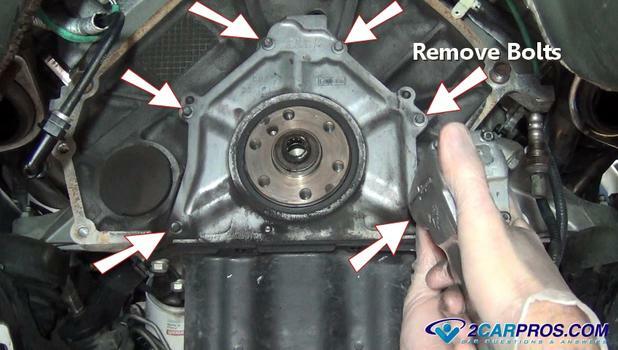 Use a large screw driver or pry bar to remove the engine plate to clear access for the rear main seal housing. There may or may not be will be two or four oil pan bolts that go through the oil pan and up into the rear mails seal's housing. Remove these bolts 10mm, 12mm or 13mm bolts and put them in a container for safe keeping. The seal housing will have a series of 6 to 8, 8mm or 10mm bolts holding the rear main seal housing to the rear of the engine block. 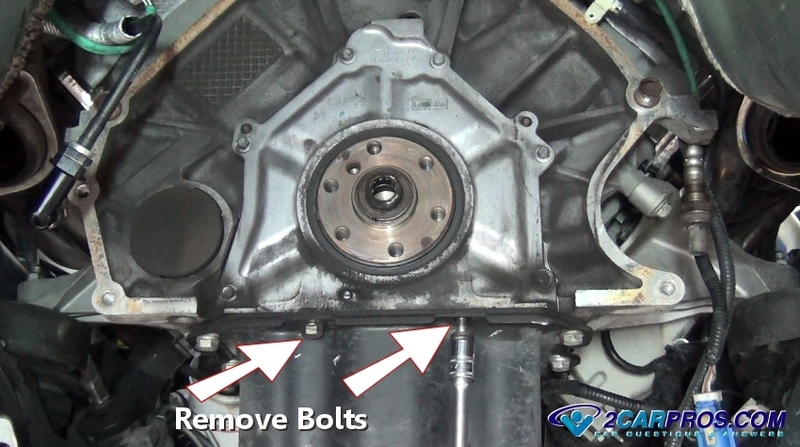 Remove the bolts by turning them counterclockwise and also put them in a container for safe keeping. Now the seal housing will be able to be removed. 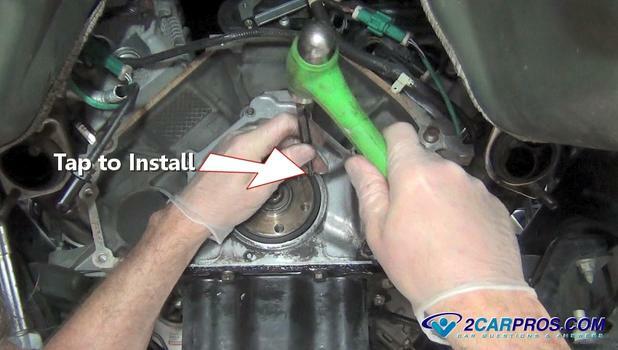 Using a large standard screwdriver gently pry the housing loose from the engine block. As you work around the edges of the housing lift with your other hand using a rocking motion. It can be a little stuck because the housing is mounted on dowels in the block. Now the housing will come loose from the engine block. Be careful not the drop the housing because it is aluminum and can crack if it hits the ground hard enough. This part will need to be cleaned before it can be reinstalled. 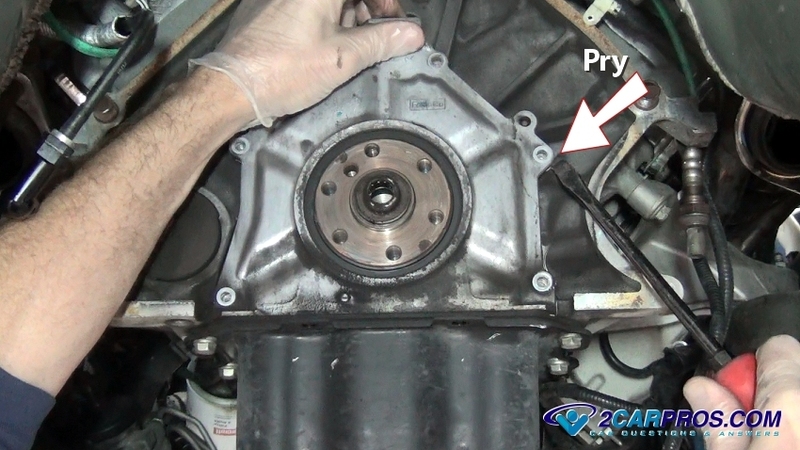 Usually the seal will come off with the housing but sometimes they can get stuck on the crankshaft. 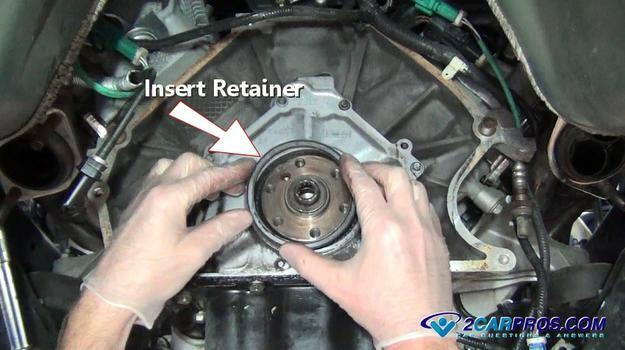 Without scoring the crankshaft gently pry the seal retainer until its removed. This particular seal has a plastic retainer that is meant to give an added layer of protection to the seal. Here is what the seal retainer looks like when removed. It is a simple plastic ring that pushes into place once the seal in installed. 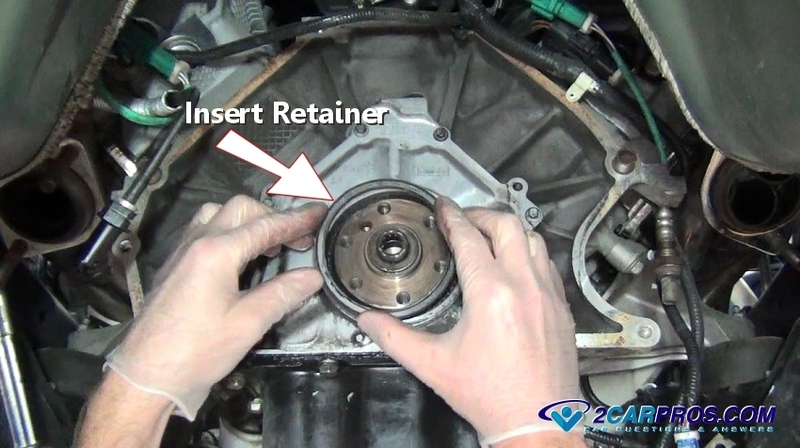 This retainer is designed to keep the seal from moving while in operation. Now remove the rear main seal by hand from the crankshaft hub. Match the new rear main seal to the old unit, they should match identically in size. Some rear main seals can be redesigned from the factory and might be slightly different in appearance but should still have the same inner and outer diameters. This part is important: The direction the rear main seal is installed will mean the difference between the seal working or leaking. The lip of the seal must go toward the engine and over the crankshaft without damage. Some seals will come with an installation tool which is a thin plastic ring that the seal sides over the crankshaft hub. 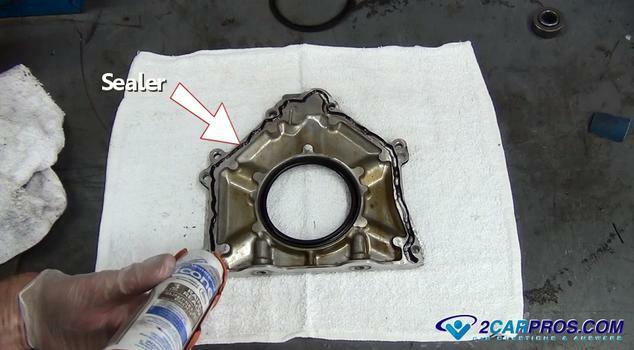 Use a gasket scraper and carburetor cleaner remove all the old gasket material, oil and grime from the seal housing. 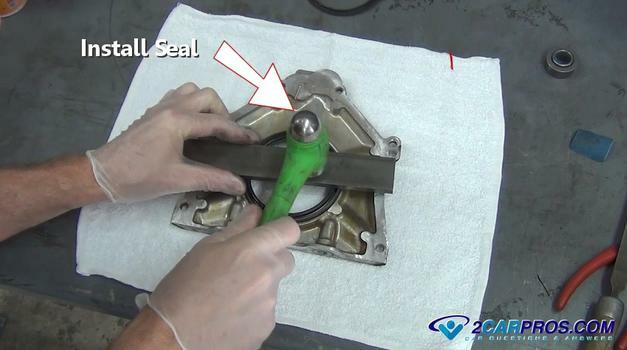 Once the seal housing has been cleaned thoroughly gently and correctly in place the seal in the housing. In the image below the lip of the seal is facing upward. Using a flat piece of mild steel and a hammer positioned above the seal, gently but evenly hammer the seal into place. You don't want to have the seal go in at an angle because this will distort the seal and may cause it not to work correctly. The seal will be completely installed when it is flush in the seal housing. Check the installation by running your finger around the seal feeling for evenness against the housing. Once the seal is installed apply a thin layer of sealant to both top and side sealing surfaces. Before doing this step prepare the block for the seal housing installation so the sealer does not start to dry. We must now prepare the block to reinstall the seal housing and the rear main seal. Use a shop towel and carburetor cleaner to wipe clean the gasket surfaces while avoiding getting cleaner and debris into the oil pan. 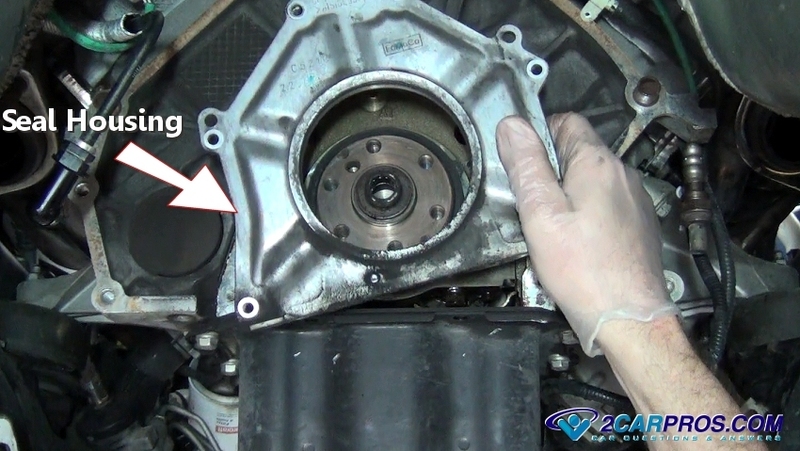 Position a cloth over the oil pan to avoid debris getting into the pan while resurfacing the crankshaft seal hub. Use a small piece of emery cloth or fine sand paper, about 400 grit. 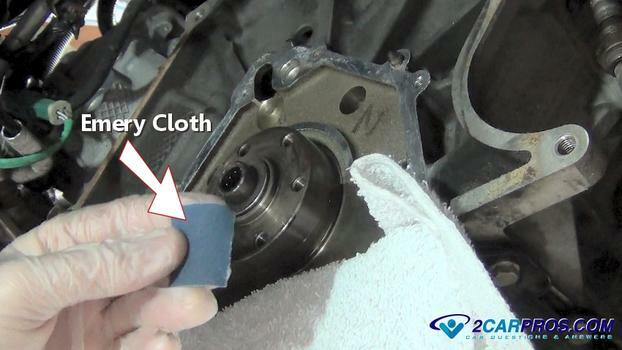 Use the emery cloth to polish the crankshaft journal this step is used to give the new seal a fresh surface to ride against. 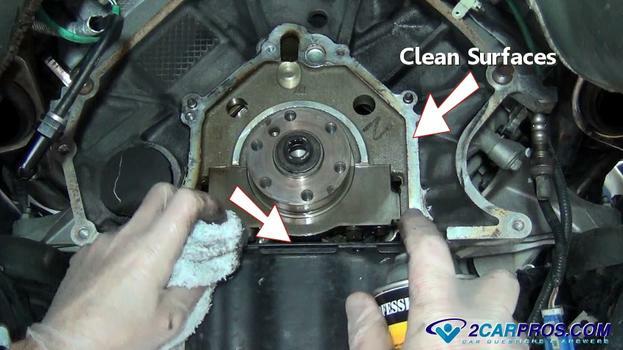 Finish by wiping down both the crankshaft and gasket surface free of oil and dirt and remove the cloth from the oil pan. Recheck the oil pan and block for cleanliness. All surfaces must be oil free to seal properly. While lifting the oil pan gasket slightly apply sealer to the oil pan and gasket, and into the corner of the block. 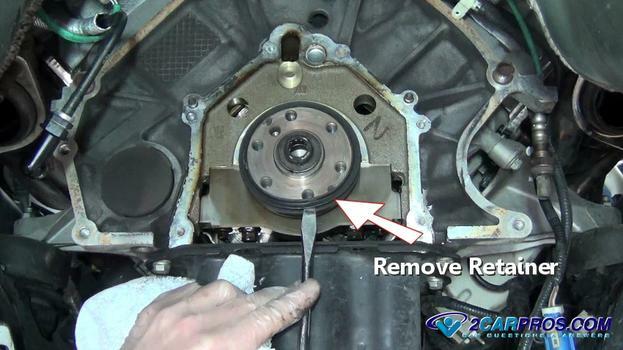 Apply a small amount of engine oil over the crankshaft seal hub surface before installing the seal. When installing the rear main seal housing along with the new seal, the lip of the seal must be lifted over the end of the crankshaft. The lip wants to fight it so push half of the seal onto the crankshaft then pull it down and around to work the remainder of the seal into place. 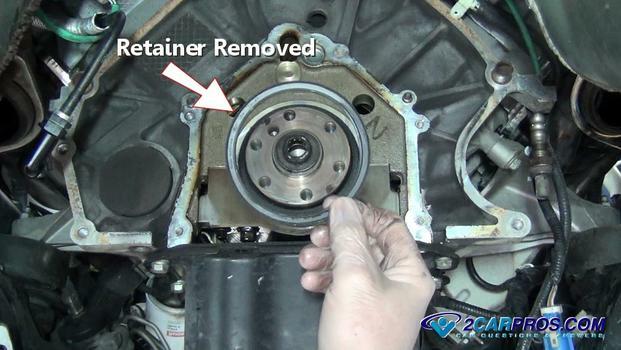 Do not use metal objects to help get the lip over the crankshaft this can damage the seal. Some seals are designed with an application sleeve which is removed after installation. After pushing the seal housing into place, (sometimes tapping it with a hammer helps) reinstall all block and oil pan mounting bolts by hand to avoid cross threading. Tighten the block side bolts in a star pattern first and torque to manufactures specification which is usually 6 to 8 foot pounds. Finish the installing of the seal housing by tightening the oil pan bolts to about the same torque setting. 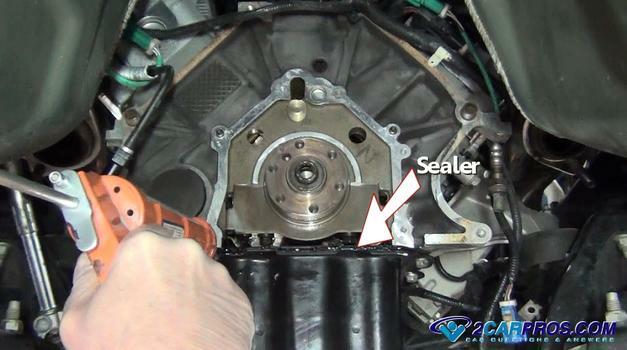 Place the seal retainer ring into place over the crankshaft seal. Use a small punch and hammer and evenly install the retainer back into place. Do not over install this could push the seal out of the housing. Then reinstall the engine plate. The rear main seal job is now complete. 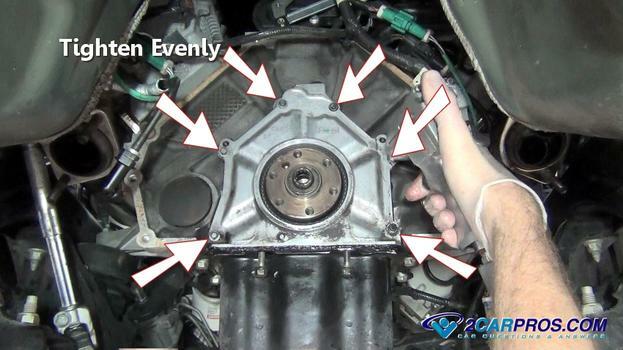 Continue the reassembly of the flywheel, clutch and transmission. It is recommended when doing a job like this to change the oil and filter since the engine was open and a small amount of dirt and grease could have failing into the oil pan. Here is the complete job getting done including the exhaust, clutch flywheel and transmission removal. 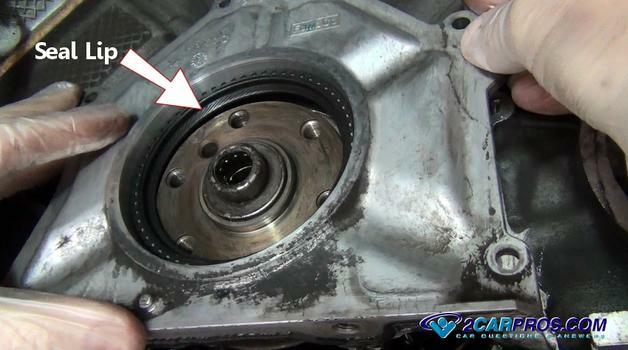 If you have any rear crankshaft main seal questions please visit our forum. If you need car repair advice, please ask our community of mechanics is happy to help you and it is always 100% free.